Visit GearX online at GearX.com as your source for the best selection of camping, hiking, backpacking, rock climbing, skiing, kayaking, and adventure travel gear at amazing prices. 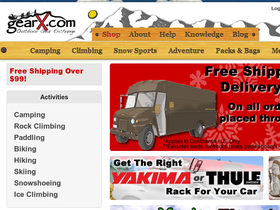 GearX provides all the latest outdoor equipment for the adventure traveler in you! GearX carries brands such as Black Diamond, Petzl, La Sportiva, Metolius, Mammut, DMM, Wild Country, Grivel, Evolv, CAMP, Scarpa, Gregory, Vaude, Sierra Designs, Nemo, Jetboil, MSR, Low Alpine, Black Diamond, Kershaw, Spyder Co, Ruff Wear and many more. Check out 58Coupons.com for the latest GearX coupons, GearX discounts, and GearX promotions. Spend over $99 or more at GearX.com and enjoy free shipping on your order! Click link to check out this awesome deal. Check out GearX and you can save up to 50% off a wide selection of outdoor gear. Click link to start shopping. Visit GearX.com and enjoy up to 46% savings on select travel backpacks! Click link and shop. Shop at GearX.com and save up to 40% on select climbing slippers. Click link and save. Save up to 46% on Hydration Items from GearX.com. Click link.